← Here’s why the globalists geoengineered and aimed HARVEY at Texas. Saul Alinsky dedicated his book Rules For Radicals to Lucifer. Hillary Clinton has had a fixation on the radical Marxist organizer Alinsky for decades and in 1969 wrote her 92-page college thesis at Wellesley titled, “There is only the fight- An Analysis of the Alinsky model.” Her first summer internship was at a law firm where two of the four partners were Communists. The firm was known to represent members of the Black Panther Party and other left wing defendants as well. Targeting and attacking enemies has been a Clinton trademark and the Clinton death list, that the media refuses to talk about, continues to grow. In their book “The Shadow Party- How George Soros, Hillary Clinton, and Radicals from the 60’s Seized Control of the Democratic Party” David Horowitz and Richard Poe explained how Alinsky excelled at wooing wealthy funders. Start up money for his Training School for Radical Organizers came from Marshal Field lll, Sears Roebuck Jewish heiress Adele Rosenwald-Levy and Jewish Wall Street investment banker Eugene Meyer who also owned the Washington Post. Like Alinsky’s benefactors, today’s radicals led by another committed Alinskyite, Barack Hussein Obama’s troops in Black Lives Matter, Antifa, and other left wing groups are funded by Jewish billionaire George Soros. There is a battle being waged in our country by patriots who want to preserve our Constitution vs Globalists and traitorous politicians both Democrat and Republican who have sold out to a globalist agenda that includes open borders, gun confiscation, loss of American Sovereignty, the UN’s Agenda 21, which says nothing we currently do is considered sustainable, and the loss of the Bill Of Rights and the freedoms that go along with it. For the last eight years, Barack Obama and Hillary Clinton have led the charge with false flag attacks like the Boston Bombing, Sandy Hook and the Orlando shooting to name a few that have all the hallmarks of manufactured events. .Charlottesville was another in a long list of organized and George Soros financed “agitation propaganda” that has been spreading from city to city with Democrat Mayors like Michael Signer of Charlottesville. Mr. Signer worked for John Podesta at George Soros “Center For American Progress.” Virginia Governor Terry McAuliffe has a long history with the Clintons and the Obama’s and has conspired with both in the past. Former insider and admitted hitman for the Clintons, Larry Nichols said that the Soros group are training activists to pose as Conservatives to control and crank up the violence from both sides, and Charlottesville was a good example of this practice in action. Antifa is not a protest group. they are the Millennial’s KKK. They are trying to scare Trump supporters away from these events so they can say that he is losing his support. The Democrat Mayor of Phoenix, Greg Stanton, where Trump held a recent rally, said he was very disappointed that Trump was visiting and Told people not to attend because it was too soon after Charlottesville and might not be safe. Ads were being run in the Phoenix area in the week prior to the event for paid protesters at $25 per hour to protest Trump’s visit. No surprise that thousands of violent mask wearing Antifa and BLM protesters showed up to harass Trump supporters and throw urine and feces at anyone who isn’t one of them, even attacking police and mainstream reporters. This disgusting practice has become a trademark of the Antifa and Black Lives Matter protesters. Barack Obama signed Executive Order 13391 on March 6, 2016. It’s the ” Patriot Defense of Liberty Enabler Act”, which forces the US to be in compliance with the UN’s Agenda 21. It also states that if a group of people is being oppressed in a country under this agreement, the UN can step in and force that country to act to protect that group for humanitarian purposes. Folks, their plan is to ratchet up this manufactured violence until the UN says they have to come in and stop the racist violence. After Charlottesville, the UN warned the US over the fake white supremacists fighting with Obama and Soros troops in BLM and Antifa. And they criticized President Trump’s response, denouncing the US for not unequivocally rejecting and condemning the racial violence. They must watch CNN. This is exactly what Soros and the globalists want. Executive Order 13391 turns all Federal Territories over to the UN’s Agenda 21 in case of a national emergency or civil disobedience. Trump can stop this if he has any power left by then. It appears the Generals are in charge and McMaster was a never Trumper from way back. As a matter of fact, he still talks to his old pal George Soros on a regular basis according to Roger Stone. Trump needs to explain to his followers why this man still has a job in his administration. Rex Tillerson, General Mattis, and Steve Cohen, another never Trumper have all made disparaging remarks about the President recently. Why in the hell do any of these people still have jobs in this administration? Trump needs all the loyalists around him he can find. Why then is he still surrounded by Obama holdovers? The FBI just refused to release a trove of Hillary Clintons documents this week because of lack of public interest. Where in the hell is Trump on this? Wikileaks recently outed six Republican traitors who were accepting funds from Hillary Clinton to work against Trump winning the election and to undermine his agenda if he did win. The Republicans named are John “Traitor” McCain, Paul Ryan, John Kasich, Carly Fiorina, Jeb Bush and Lindsey Graham. This is all being covered up by the Media. What a shock right? This from an e mail from John Podesta to Huma Abedin where they discuss diverting campaign funds to the afore mentioned traitors for their agreed cooperation. Funds were diverted to Superpacs for Bush, Fiorina, and Kasich, and FEC reports show that two large donations from Pac’s and private donations went to Traitor McCain in early October 2016, right after he publicly criticized Trump. Oh, and Dana Rohrabacher just back from a meeting in England with Julian Assange says he is 99% certain that the Russian hacking story that Rachel Maddow led the hyperbolic charge, is complete nonsense. The mainstream media has never been more deceptive than they are today, and Internet news has never been more vital to a nation on the brink, yet net censorship is getting worse every day. So who controls us? Ernst Zundel could have told you. No one talks about it much but we all think about it quite a bit I’m sure. I am in no way a racist but this is is a subject that is relevant to our tyranny. 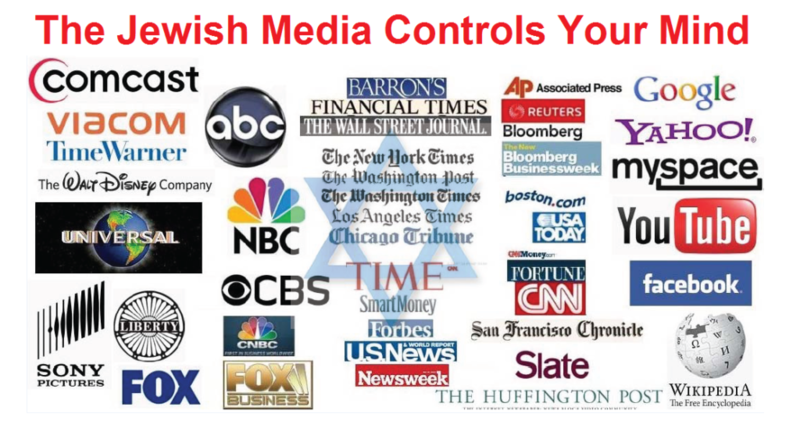 Just about all of the media is owned and controlled by wealthy Jews( Yes Rupert Murdoch’s mother was Jewish). Google, Facebook, Yahoo, Wikipedia, e bay, Myspace, Paypal, and Youtube are all Jewish owned and controlled and every one of them is currently blatantly and openly censoring Net content with no good explanation. This is unacceptable. Trump needs to address this issue now! This is too important to wait. These Corporations have a monopoly and should be governed by a government agency. Amazon.com has banned over one hundred book titles this year because the Jewish Anti Defamation League told them they were offensive. I wonder just what it was they didn’t like about James Fetzer’s excellent book, “Nobody Died At Sandy Hook?” Youtube is banning Ron Paul’s video’s on politics and the economy. Yeah, what’s an 8 term Congressman know about politics and the economy anyway? The hateful, Jewish controlled Southern Poverty Law Center has compiled an extremely long list of so called haters, so they have become self-appointed arbiters of acceptable content. Have you seen all of the rich people who gave fat checks recently to the ADL and SPLC? George Clooney, of course, gave the obligatory million bucks to the SPLC. Rupert Murdoch’s son James, the new CEO at Fox, sent the ADL a million bucks, and Apple CEO Tim Cook just gave a cool million to the SPLC and the ADL. To fight hate. I’m not kidding. Colin Kaepernick Wonders why the American police have been killing people at an alarming rate the last 15 years or so. They are on pace to kill over a thousand of us this year. Why? They are treating us the way the IDF soldiers treat the Palestinians, that’s why. It might have something to do with all of the Israeli Police training they’ve been getting since George W Bush made that mandatory shortly after 911. It was around the same time Bush signed the unpatriotic Patriot Act that gutted the Bill Of Rights. Both Bush and Obama escalated the illegal spying on every American to unacceptable and frightening new levels and They aren’t looking for terrorists. We are all Palestinians now. The only thing President Trump has going his way so far is the economy and the globalists could take it down at any moment. Then what? UN Troops? I wonder what George “The Dumber,” would say? Probably something profound like, Don’t worry about your rights goddamnit, there are terrorists everywhere!. Right, George. Thanks a lot. Still waiting for that evidence on 911 pal. Hey George, I think the Jews might have been behind 911. 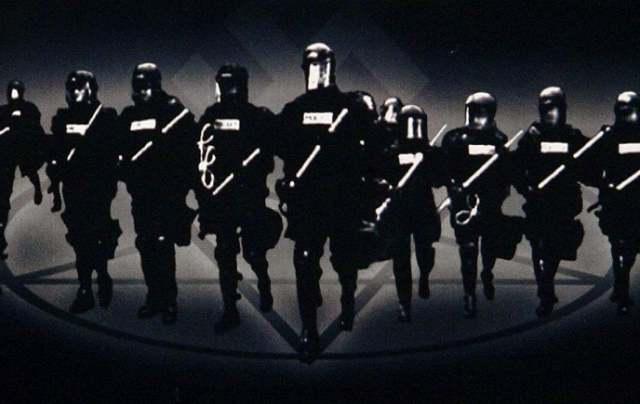 I think maybe you’ve got the wrong people training our police. I think you’ve made a horrible mistake. Or did you.